You may have seen it on The Colbert Report. A proposed walled city of “patriots,” known as The Citadel, received the particular dose of sarcastic humor the show reserves for militiamen and gun nuts. Colbert’s reading of the requirement that all patriot residents must own one AR-15 and 1,000 rounds of ammunition, and periodically prove their weapons’ proficiency, drew the most laughs from the audience. Six months later, this past June, when several of the Citadel’s principals appeared on Glenn Beck’s television show, the tone was just the opposite. A measured, serious discussion occurred, and the pros and cons debated of patriots’ settling in mountainous Benewah County, Idaho, and building a city where Thomas Jefferson’s “rightful liberty” would rule, and employment be provided in a weapons-manufacturing facility. Now, after a year of justifiable skepticism about the walled city’s prospects, expressed by the Benewah County Sheriff, and criticism of the project’s leadership by rival militia factions, the group behind the Citadel is taking the next steps. On September 6–8 it gathered at a twenty-acre plot it had already purchased as a starter base-camp, according to county records. A couple dozen or more militia-types are thought to have traveled off the main highways and up the unpaved logging roads for close-quarters battle training and a self-styled patriot convention. They housed themselves in tents and RVs. Jim Miller, a fully licensed arms manufacturer at the heart of the Citadel’s plans, was in attendance. Perhaps he sold some of the guns he has recently built, AR-15s—a civilian replica of the American military’s M-16s. Chris Kerodin, the Citadel’s central idea man and principal propagandist, taught hand-to-hand combat courses known as CQB—close-quarters battle. They also were slated to make plans to eventually attract 300 “patriots” to their ranks, people willing to “go into harm’s way,” and “clear Black Panthers from the voting stations,” according to one of Kerodin’s frequent blog posts. Whether or not the Citadel is built, the gathering itself is important: it could become the most significant turning point in the militia and survivalist world since Timothy McVeigh bombed the Oklahoma federal building in 1995 and the FBI crackdown on armed paramilitaries that followed. Many book-length accounts of the militia movement of the 1990s have concluded that it began with a few key meetings, a half-dozen principal personalities and three decisive events. These last—two FBI and ATF imbroglios at Weaver Mountain and Waco, and the passage of the Brady Bill, a minimalist piece of gun control legislation—convinced Christian patriots and white supremacists that the government was planning to kill them or take their guns away. Men such as John Trochmann from the Militia of Montana (reported on at the time by Marc Cooper for The Nation) and Mark Koernke from Michigan traveled the country promoting the militia model, and helped knit the various local and state militia groups into a movement. One particularly good salesman, Bo Gritz, traded on his service in Vietnam and chest full of military medals to sell his own package of survivalist trainings. Eventually, he turned his reputation into a land deal in Idaho, a “Christian Covenant Community” he called Almost Heaven. The movement disappeared as law enforcement officials cracked down in the wake the Oklahoma City bombing. In 1996, when the FBI peacefully closed down an encampment occupied by Montana Freemen, who had been cheating their neighbors and other patriots with funny money deals, they scored a significant publicity victory. Leonard Zeskind’s book Blood and Politics: The History of the White Nationalist Movement From the Margins to the Mainstream argued that by the time Oklahoma City bomber Timothy McVeigh was executed in 2001, the movement character of the militia phenomenon was long dead. Local militias continued to exist, but in a much reduced state. After the election of President Obama, small local militias began popping up again, as the Southern Poverty Law Center and others have documented. SPLC counted 1,360 active patriot groups in 2012, many of them militias. One militia at a Georgia military base has allegedly already left two dead. In Minnesota, a militia plot allegedly included plans to bomb the National Guard armory. In Pennsylvania, a police chief created a militia and then posted two videos of himself shooting a string of weapons while yelling a string of vulgarities at Democratic Party political figures. A new generation of local survivalists is preparing for a doomsday they feel is certain to come. They do not yet constitute a movement, however. The Tea Parties, on the other hand, were well connected in several national factions and did in fact become a movement after their first big national demonstration in September 2009, as the Institute for Research & Education on Human Rights (IREHR) showed in its 2010 report, Tea Party Nationalism. And local militia groups in Georgia, Oklahoma and Southeast Michigan are close to the Tea Parties. When a Tea Party “Day of Resistance” was organized in February, IREHR counted gun rallies at 138 locations in thirty-eight states. A Public Religion Research Institute poll released that January found that 55 percent of Tea Party members supported the right to carry their guns into church. On March 25, The Washington Post noted that “in the days that followed, glass windows and doors were shattered at local Democratic Party offices and the district offices of House Democrats from Arizona to Kansas to New York. At least 10 Democratic lawmakers reported death threats, incidents of harassment or vandalism at their offices over the past week, and the FBI and Capitol Police are offering lawmakers increased protection.” One of those offices vandalized was that of Representative Gabby Giffords,who was shot less than a year later. Threepers are so named because of their belief that only 3 percent of the colonial American population served in the militias that ousted British rule and established the United States of America. They used the Roman numeral III as their symbol. The Citadel’s Chris Kerodin initially emerged under the wing of Vanderboegh. But he soon broke with the Alabama militiaman because of what he felt was his failure to do more than issue Internet edicts, according to Kerodin’s blog. And Vanderboegh claimed that Kerodin was a conman. Kerodin’s Threeper blog shared the Tea Parties’ veneration of the Constitution and the Founding Fathers, and excoriation of un-American liberals. In return, Tea Party leaders such as North Carolina’s David DeGerolamo used the Tea Party Nation’s blog to promote Kerodin and Threeper ideas about the Constitution and the Three percent among his larger constituencies. But Kerodin deliberately aimed his message at a smaller, still inchoate grouping. He explained his reasoning in a December 29, 2010, blog post: “If the III represents the Patriots who are willing and able to take the field in a ruckus, it is the Tea Party who represents the larger population of Patriots who support Restoration, but are unwilling or unable to puts their butts on the line and face enemy fire…. So, let us not be too hard on our Tea Party allies…. We will need safe houses, medical attention, food, water, ammo, and all the other logistical support offered by our allies.” A fair assessment of this strategy is that the Threepers intend to be the armed wing of a larger movement of Tea Partiers and patriots, in a manner not unlike the way armed movements of a revolutionary left once swam in a sea of like-minded supporters. At first glance Chris Kerodin, 46, is an unlikely militia leader. A thorough search of court documents made possible by the Nation Investigative Fund revealed that Kerodin was born and raised in the Maryland suburbs of Washington, DC, as Christian Allen Hyman. He spent his youth training at a traditional Akijutsudojo in Washington, DC, and with people he called “groundfighters” in Torrance, California, according to Kerodin’s blog. His martial arts “skill set,” as he calls it, serves him well in his current incarnation doing close-quarters battle training. He changed his name to Kerodin in 2003, when he began a convoluted effort to scam shopping centers with a phony security scheme in the post-9/11 scare. He was convicted on a weapons charge and a felony for the scam and served about two years in prison, and thus is prohibited from owning or possessing a weapon. His wife, Holly, who is a person of color, stuck with him during this period, and the two have a tight bond, according to Kerodin’s blog. Despite not being allowed to handle a weapon, he has emerged as a Threeper leader by dint of his aggressive web presence and the sheer volume of his energy. Kerodin backed Pat Buchanan’s third-party bid in 2000, and was a member of the Tea Party Patriots’ social network in 2010 and 2011, even while he purveyed Threeper ideas. He wrote two books on the constitution and militia activities. Now he is making a deliberate attempt to knit together the geographically disparate sections of the Threeper phenomenon into a more powerful force. By October 2012, in a post about a North Carolina Patriots Convention held by Threepers, Kerodin decided that more was needed than simply posting on the Internet. He wrote, “When Patriots get to meet Patriots without the internet in the way, real gains are made.” While Kerodin’s words may seem like a truism to the outside observer. Inside the Internet-reliant world of militias and survivalists, his maxim represented a breakthrough. Shortly afterward, Kerodin and crew began pulling together a militia “congress,” which met on April 19 at the Kings Mountain National Military Park, a Revolutionary War battle site on the border of North and South Carolina.It was attended by a small number of Threepers who had been blogging and communicating on the Internet, but had not yet met. They spent their time that day touring the park sites and talking informally, according to blogs posted after the get-together. Since then, Kerodin and his wife Holly have been touring the country, staging close quarters battle training for $210 a person. These likely have been a source of income for the Kerodins, as they require that at least eight people attend. These combat trainings have also turned into a useful network-building operation, bringing Kerodin into personal contact with a constituency of possible followers, and in the process transforming him from simply another ambitious far-right blogger into a militiaman with stature and standing. A 2013 survey taken by reporters for The Nation of the Kerodins’ CQB trainings after Kings Mountain showed Kerodin in Rockford, Illinois, in June; then in Olathe, Colorado, and Gallipolis, Ohio, in July; and in Montgomery, Fort Lauderdale and Southeast Michigan in August. Patriot bloggers then spread the message that he is not a scammer, as some have claimed, but a genuine patriot making a real contribution to the cause. The postings hit a nerve among Threepers and survivalists, according to Kerodin’s reports. On November 29, Holly and Chris Kerodin registered with Idaho Secretary of State a limited liability corporation known as the Citadel Land Corporation. 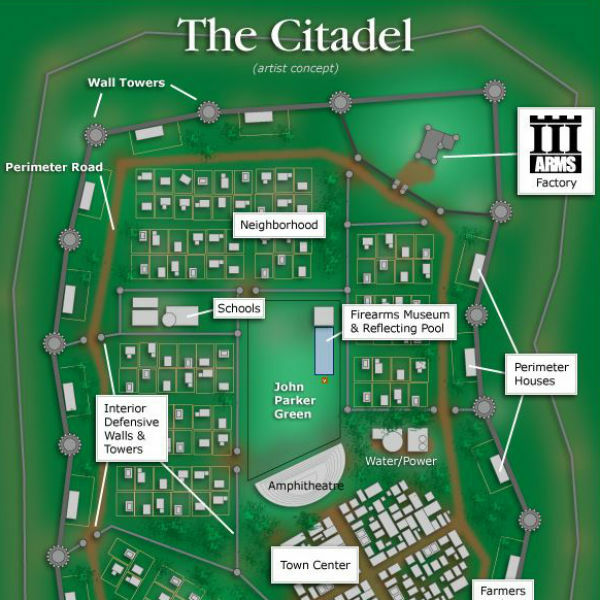 An artist’s rendition of the Citadel was developed and posted on the Internet; several weeks later The Colbert Report showed it on national television. The Kerodin’s counted that as free advertising, and an unknown number of applications came in through the Internet. It was to be a walled city, with an outer wall and inner walls. Entry and exit are through one main gate. Three different neighborhoods are shown, along with schools, a town center, farmers market and a firearms museum. The economic engine of the place, III Arms Factory was prominently portrayed. A price calculator on the website is supposed to enable prospective buyers to determine housing costs based on square footage, the size of the lot and whether the place was to be built inside the walls or outside. A 2,000-square-foot unfinished home, on an acre lot outside the walls is calculated to cost $1,111 a month. A 900-square-foot home on a quarter of an acre inside the walls is $500 a month, $580 if the Citadel does the work to finish the exterior. The Citadel looks like anybody’s vision of a small-town utopia– except for the III Arms Company that makes up the one absolutely necessary ingredient of the whole enterprise. James L. Miller Jr., according to corporate records, is at the center of the weapons manufacturing operation. According to Miller’s online postings, he maintained an interest in guns, preparedness and President Obama’s birth certificate. Skilled as a machinist, he registered “Millerized” with the State of West Virginia in 2010 and opened a machine shop in Berkeley County that customized motorcycle accessories. He also applied for and received his Federal Firearms License, and did some work customizing weapons also. After getting divorced, however, Miller closed up the motorcycle parts business and on June 30, 2011, filed the necessary paperwork. Four months later he joined forces with Kerodin’s Threepers. In August 2012, he restarted his firearms business, which became III Arms Company that October, according to the West Virginia secretary of state’s office. Since that time he has written publicly about taking orders and buying equipment and materials. Finally, he started manufacturing AR-15s this summer, which are being sold for about $1,500 each. Weapons prices are on a steep rise right now, and there is little doubt that Miller will be able to easily sell every rifle he produces. Soon, if the group’s writings are accurate, the profits will be plowed back into the Citadel enterprise. Miller has also become a minor celebrity among Threepers, and he has added to Kerodin’s networking with his own appearances at Patriot Convention in North Carolina and elsewhere. After the September 6-8 gathering in Idaho, Miller wrote in a blog post that he will start touring the pre-Christmas gun-show circuit, selling weapons and spreading the Threeper militia idea. After the Idaho meetup, Kerodin will also spend the rest of September traveling to CQB sessions and Patriot Conventions in Texas, Upper Michigan and Wisconsin. They are building a militia movement the old-fashioned way, through personal contact and combat training. The future of the Citadel cannot be fully known at this point. Much depends on Kerodin’s ability to attract enough financing to buy the huge tracts of land necessary beyond the initial twenty acres already purchased. It is also not certain that building contractors, craftsmen and entrepreneurs will move to a walled city, and unclear whether county and state zoning officials and regulators will give the necessary permits. There is ample room for skepticism about this project’s ultimate prospects. What is certain, however, is that Kerodin and his fellow militiamen are building a dangerous movement of zealots, with appeals laced with predictions of violence. The gun-manufacturing operation at the center of this movement is a development without precedent in the post–World War II era. The possibility of future violence rises in direct proportion to the proliferation of weapons.